I liked his pictures from the first time I saw them, and as I had collected a number of them, I thought I would share my pleasure with my friends and townsmen so I hung them in my rooms and asked people to come and see them. Well they came but they laughed so at my pictures and made such fun of my taste that I took all the Corots down and put them away and did not show them again for a long while. - Seth Morton Vose, interview with Clarence Cook in The Studio, April 1891. 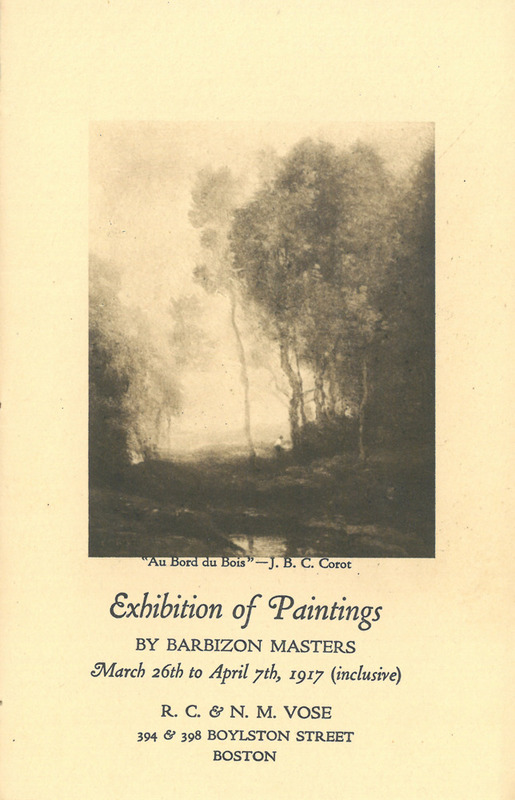 The popularity of the French Barbizon School grew exponentially during the 1880s in an expanding art market that America would not experience again until the 1980s. During this affluent period, Seth Vose was finally rewarded for his efforts as curiosity emerged surrounding his inventory of Barbizon School paintings. His firm would import or advise the acquisition of nearly half of the pre-Impressionist French paintings in the collection of the Museum of Fine Arts, Boston. The acceptance of the Barbizons by Boston's elite excited a terrific competition for the acquisition of paintings by artists such as Corot, Daubigny, Millet, Rousseau and Delacroix. This competition occasionally turned uncomfortable, as in one incident in which Seth was discussing a painting in the gallery with a Boston collector. A second collector, who was typically known as a consummate gentleman, took charge of the situation by tossing his cape over the painting and claiming it for his own. The first client rose, said goodbye to Seth, and left quietly. It would take one hundred years for the art market to reach another such dramatic decade.